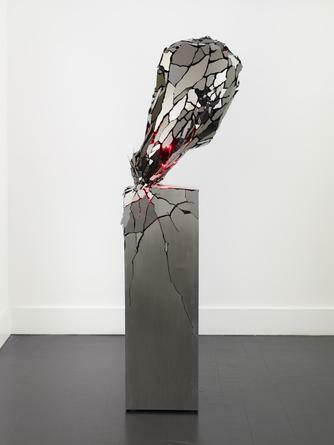 SANDRA GERING INC. is pleased to present Ksana, Li Hui’s first exhibition with the gallery. 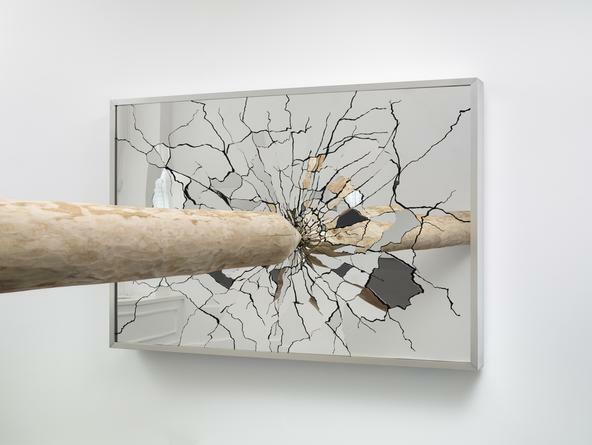 For the past decade Beijing-based artist Li Hui has become renowned for surreal, metaphorical installations involving themes of time, space and light. Ksana, the Sanskrit word describing an imperceptible fraction of time, is used here to define the unobservable moment when opposites collide to create a new circumstance: a Buddhist philosophy at the heart of much of the artist’s work. Ksana is presented in two examples. 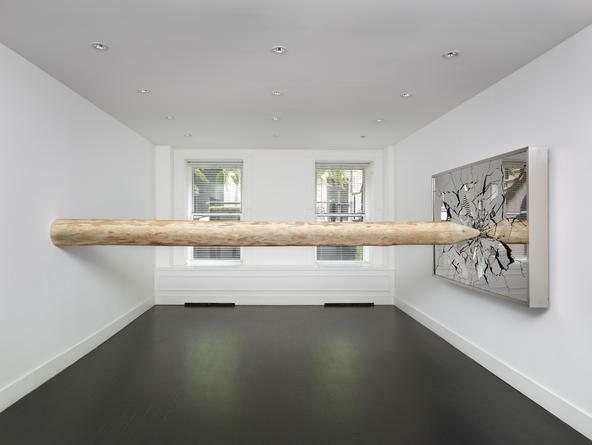 Hui has turned the gallery’s main room into a scene that focuses on the split second when a suspended 500 lb. 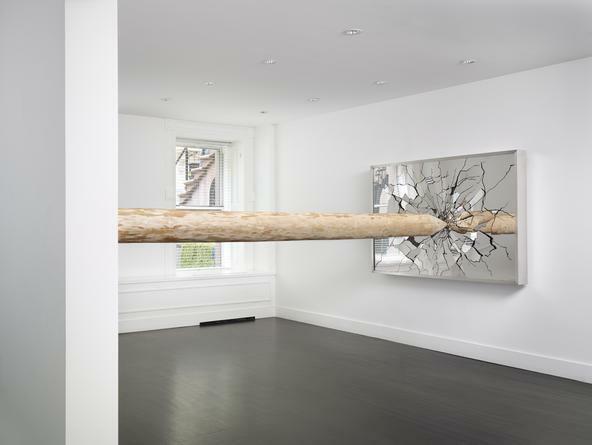 tree trunk pierces a pristinely shattered mirror-finished steel surface. The result suspends time long enough for the viewer to contemplate the instant two implacable forces meet to create a third. 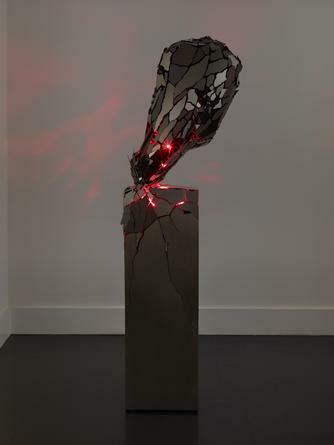 The exhibition’s second example is subtler in approach: a giant, glowing shattered heart is perched precariously on a similarly shattered base. The dichotomy is not strictly material. The destroyed appearance of Broken Heart belies its force, a glowing interior that indicates the persistence of life in the form of a heartbeat. Both works, explosive, theatrical and dissonant as they appear to be, are poetic examples of Hui’s interest in combining Eastern and Western philosophical perspectives. 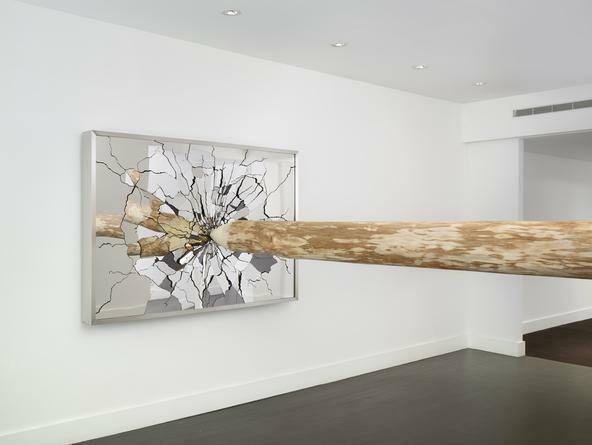 The balance between spiritual and material creates the ‘frozen moment’ of the exhibition’s title. Li Hui is a Chinese contemporary artist living and working in Beijing. Hui graduated from the China Central Academy of Fine Arts, Beijing, and has exhibited internationally since 2004. Notable solo exhibitions of Hui’s work have been presented at SCAD (Savannah College of Art & Design), Savannah, GA, Ernst Schering Foundation, Berlin, Germany, the Ullens Center For Contemporary Art, Beijing, China, the Museum of Contemporary Art, Taipei, Taiwan, the Yuz Museum, Jakarta, Indonesia, and the Light Museum, Eindhoven, The Netherlands. 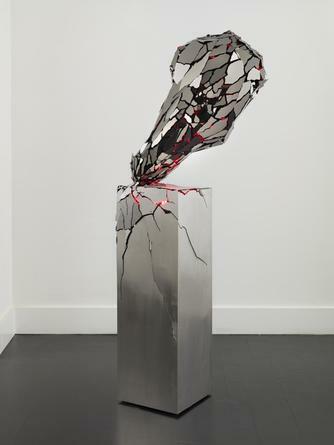 Li Hui materializes his exceptional vision of destruction and violence in sculpture as an allegory for human sociological interactions. The artist himself states of the exhibition, "The fusion of art and technology must reveal some truth about humanity." This can be seen in Ksana (derived from the ancient Sanskrit word for a fraction of a second in time) on view at the gallery through June 27th 2015. "During the past decade, Li Hui has become recognized for creating surreal and symbolic installations that involve themes of time, space and light. 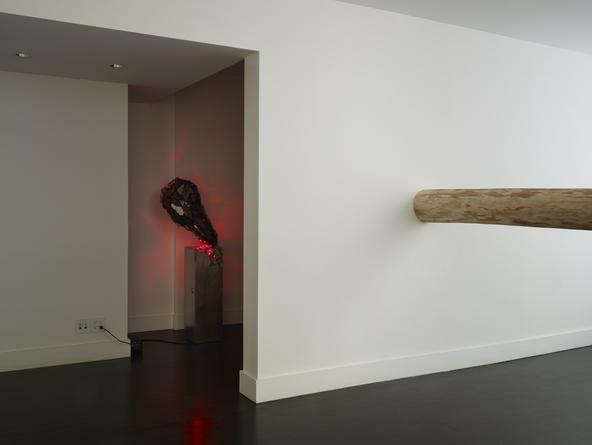 He uses these evocative installations to get the viewers to question the importance or their everyday life..."
"Li’s work is remarkable for its skilled fusion of formal and emotive qualities..."
Li Hui Ksana Interview With SinoVision.